After Pandora’s launch in 2005, online music streaming became a mainstream business industry. The success of the app encouraged many other players to start a similar service and grab a share from the big pie. SoundCloud is one such successful player. The next few minutes we will spend understanding everything about an audio streaming software. We will also find out if it is practical to develop similar music streaming app like SoundCloud, and how much does it cost from the beginning to deployment. So let’s first understand the concept and the market of the music streaming apps. How many people stream music? 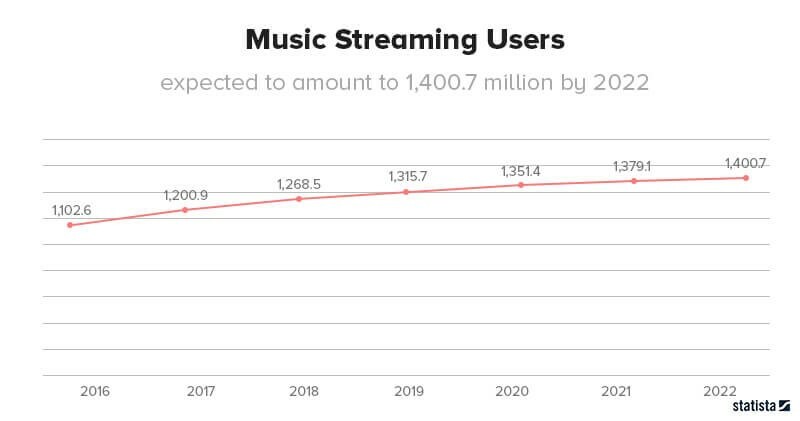 In 2017, about 1200.9 million users were using at least one music streaming service, which increased to 1268.5 million in 2018. Trends expect that this number will go beyond 1400 million by the start of 2022. It’s clear that the trend slope is not very steep. However, it is a positive fact that the slope was always upward from the beginning itself. With this rate, the market will only continue to grow upward. 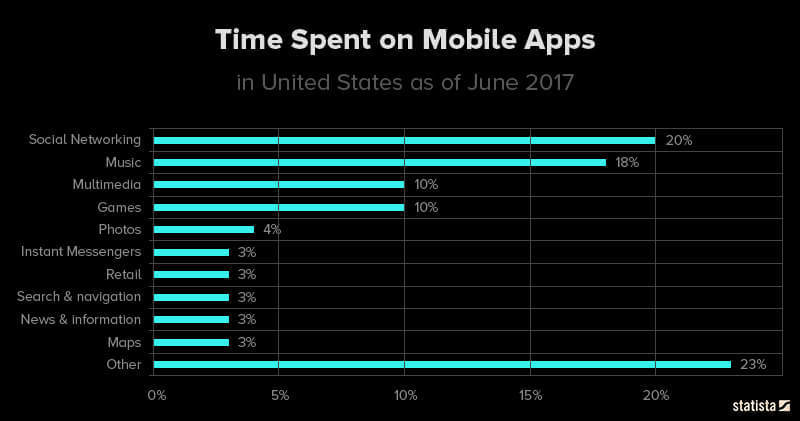 If we look at the numbers of how much time people spend on music streaming apps, it’s encouraging. In the US itself, people spend about 18% of their time streaming music, which is right next to the social media that stands highest with a 20% share. How is the music streaming market? Even with this gradual advancement, the music streaming industry is only growing positively. Worldwide, different music streaming services could secure a revenue of not less than $9,864 million. 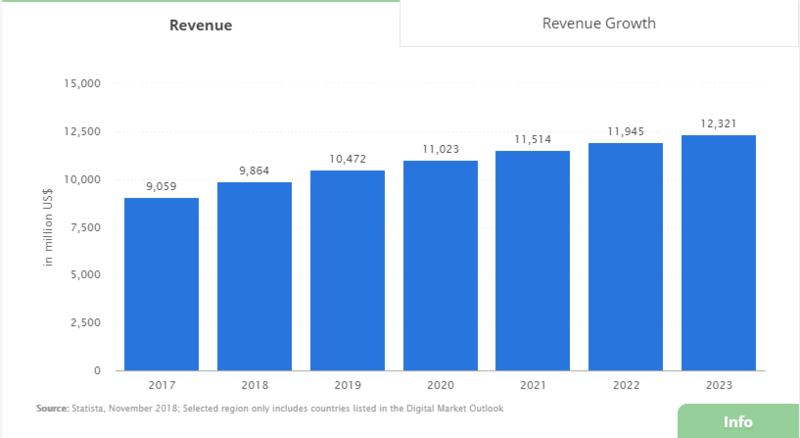 With this trend, the revenue share will eventually surpass the $12,321 million mark by 2022, which is colossal. Who are the leading players in Music Streaming? As of March 2018 report by Statista, most popular music streaming services in the United States are Apple Music, Spotify, Pandora Radio, SoundCloud, Google Play Music, iHeartRadio, and Amazon Music. 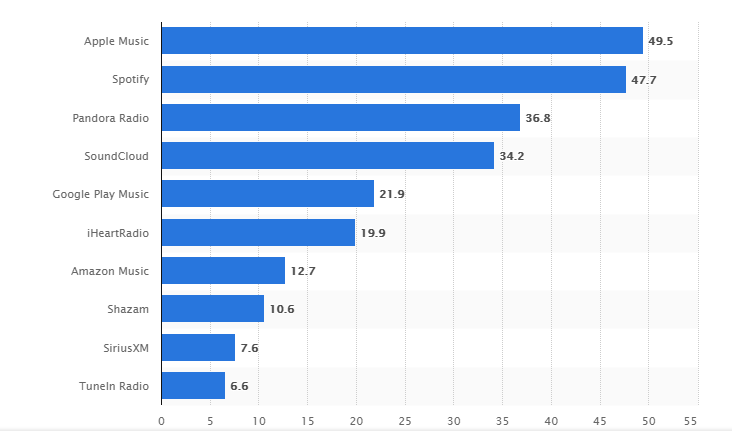 Where Apple Music is the leading player, SoundCloud is not very far with 34.2% of the US market share. Because of its unique features and community sharing, SoundCloud is sitting above the giants like Google Play Music, Amazon Music, and Shazam. The bottom line is, not only in the US, but the people worldwide are gradually moving towards music streaming via the cloud. If we look at the business models and the features each app provides, there is a massive diversion in the way they work. Take SoundCloud for example. Unlike Amazon Music or Google Play Music, SoundCloud is only dedicated to music streaming. That means, it must own multiple ways to generate revenue for its existence. Not like Amazon Music, which you get as complementary with Amazon Prime subscription. SoundCloud offers a cloud repository of music files and a way to stream them from anywhere on any device. It is like YouTube of audio streaming. It allows a user to upload his/her tracks and share it with other SoundCloud users. You can also stream the tracks uploaded by other users. You can further create your playlist by adding different tracks in it. 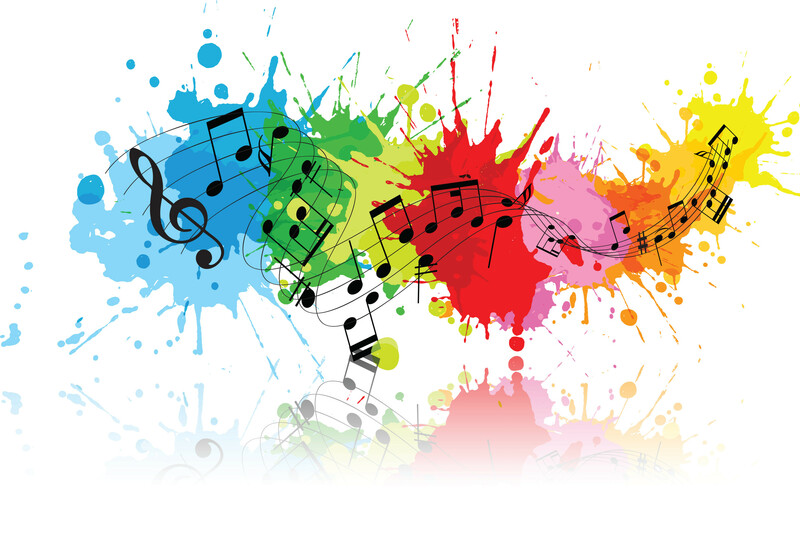 The platform is best suited of music artists who want exposure for their creations. With a highly active community, linked with social media platforms like Facebook and Twitter, you can always expect this platform to offer the coverage you need. Similarly, you can follow other users and listen to their tracks too. With all these, you get access to detailed analytics that informs you how your tracks are performing on the platform. SoundCloud is not just an Audio streaming app, but also a social media platform for building your fellowship in the music community. What is the Tech Stack for an app like SoundCloud? What are the features of audio streaming software like SoundCloud? 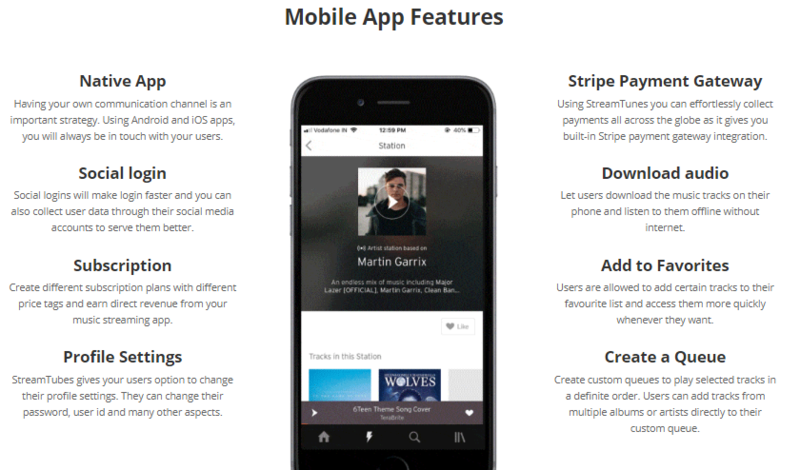 If you are developing an app like SoundCloud, you will need embedding at least the following features. User Profiles: It must allow Users to create an account and manage their profiles. User Authorization: Dedicated account registration form and social media login to let users register their accounts. Audio streaming service: API and subscription of an audio streaming server for online access to cloud files. E.g., Nginx server. Cloud Storage service: API and subscription of a cloud web service for storage. Eg. Amazon AWS. Search and organize options: An algorithm for navigation and searching of tracks using keywords, tags, song’s name, artists, etc. Playlist: option to create and save custom Playlist. Offline availability: Option to download tracks for offline streaming. It should also allow the download of a whole playlist in one go. Social sharing: Social media APIs for social login and social sharing of songs/playlist with friends. Push notification: API from any push notification service that supports push alerts for different activities and also manual triggers by the admin. Admin Panel: Web-based admin panel with full control on users, activities, analytics, monetization, and tracks on the platform. How much does it cost to develop your own SoundCloud? Breakdown by hours needed: Please Note that these are just some essential features to give you an overview. If you want to develop for Android and iOS, it will take at least 1800 hours. 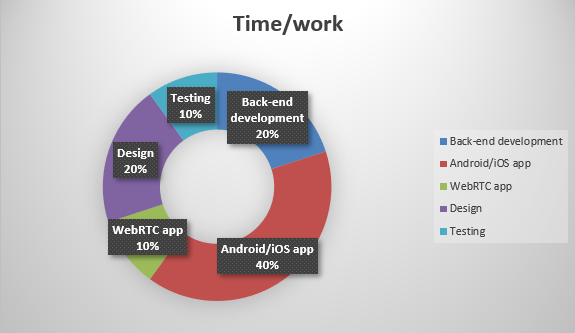 WebRTC for website based app, which is optional, but will take not less than 900 hours if you want to develop it too. Ultimately, the whole suite will take about 2700 hours, which does not include the Admin-panel that will take at least 1000 hours of development. $280.000+ for the complete suite (All apps, WebRTC, Admin Panel, Push notifications). Is there a quicker and cheaper way? Time, money and efforts wasted in re-inventing the wheel. You will face the above costs and breakdowns only when developing the apps from scratch. However, you don’t need doing this all over again. The market is full of turnkey solutions that offer ready-made scripts for developing music streaming apps more speedily and quickly. They call these as SoundCloud Clone scripts. These are nothing but ready-made app builders that let you set up your music streaming app without coding one from scratch. A typical clone script costs as low as $300 and the highest $700 for the whole suite of WebRTC and Mobile apps. They come pre-loaded with all the essential features. You can also ask the same developer to add some custom feature if you require one. For example, you can ask to customize the community feature of a script. You can hide the community feature and limit the upload access to Admin user alone. This simple Tweak will make your SoundCloud script similar to what you see on Amazon, Apple Music, or Spotify. There is no need to waste your time and money on developing the features that are already available as clone scripts. You can use any open-source SoundCloud Clone script as a base and customize the codes to re-shape the features or add any new feature as per your requirements. I don’t say developing from scratch is a bad idea. You will develop everything from scratch and have a control on even the minute aspects. However, if you are short on time and money, and cannot afford to hire your team, testing out a clone script is not a bad idea either. There are many open-source clone scripts, which offer similar customizability and control as in developing a music streaming app from scratch. I have given an estimation of both the options in this article. You can always analyze your requirements, budget, and time-frame to make an informed choice from either of the options.